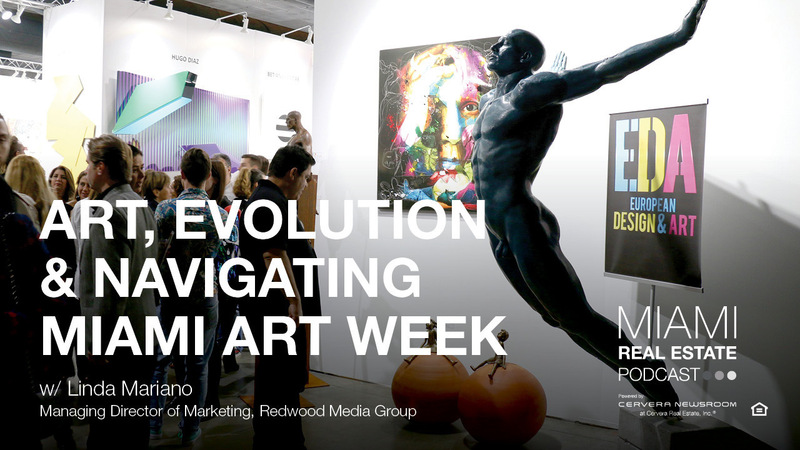 Linda Mariano, managing director of marketing for Redwood Media Group, shares insight on the evolution of art in Miami, current trends in the art world, and how to navigate the plethora of Miami Art Week fairs in this special edition of the Miami Real Estate Podcast, recorded live on-site in the Cervera Real Estate "Art of Living" lounge at Red Dot Miami Art Fair. With a career that spans 30 years, Linda is a leader in marketing, brand management, e-commerce and promotional initiatives for major retailers, specialty retail, art industry, licensing partnerships, media and entertainment, as well as entrepreneurial business environments. Linda brings her years of experience to help outstanding artists and art industry leaders set and achieve high goals. Whether conceiving a breakthrough media-based retail concept for Discovery Channel, driving an integrated growth strategy of the core demographic as the chief architect of the Thomas Kinkade brand, overseeing every aspect of a major event, or coaching an emerging artist, Linda achieves success. She has built and managed branding, marketing, PR and communications programs. She has created programs that added multi-million dollar sales via direct strategic alliances and partnerships with Disney, Warner Bros., Elvis Presley Enterprises, NASCAR, Major League Baseball and others. Discover Red Dot Miami, a contemporary art show in the heart of Miami featuring an international slate of galleries. The show features galleries showcasing over 500 leading contemporary artists, and includes Art Labs, events, and informative Art Talks focused on collecting. Now in its 13th year, the five-day event attracts over 35,000 visitors, a majority of whom are high-net-worth collectors. Join us for an unforgettable five days of cutting-edge art, entertainment, and special events. Discover Spectrum Miami, a curated contemporary art show in the heart of Miami’s artsiest ’hood. Back in the Wynwood District for the first time since 2015, Spectrum Miami is taking over the iconic Mana Wynwood. Featuring an international slate of artists and galleries, it’s where contemporary meets extraordinary. Join us for a five-day fine art experience, featuring Art Labs, Art Talks, Meet the Artist sessions, music, entertainment, and other special events. To learn more about Cervera, click here.